Today we received official word from the US Department of the Treasury, that our application for 501c3 non-profit status has been accepted. This means that we are now exempt from being taxed as a corporation in the United States, and that people from the US who contribute to our cause can now write off those contributions as charitable, making all US contributions, even by corporations, tax-free. This news allows us to move forward with our plans to seek aid from US companies and organizations that donate to causes like ours. It also adds legitimacy to our organization so that we can increase trust in our platform and how we manage our organization. We plan to continue bolstering this effort by reaching out to other organizations who align with our ideas, and asking that they partner with us to achieve our mutually aligned goals. We are beginning this effort with reaching out to the Electronic Frontier Foundation for an Observer to oversee our finances and our plans. This will allow an outside party to verify that our goals are reasonable, our spending is responsible, and that we can be trusted with your donations to do the good that we want to do. In our efforts to keep maximum transparency, we have attached a photo of the actual letter we have received from the US Treasury below. The only information that is redacted is business account numbers and addresses that we need to keep confidential for security reasons. 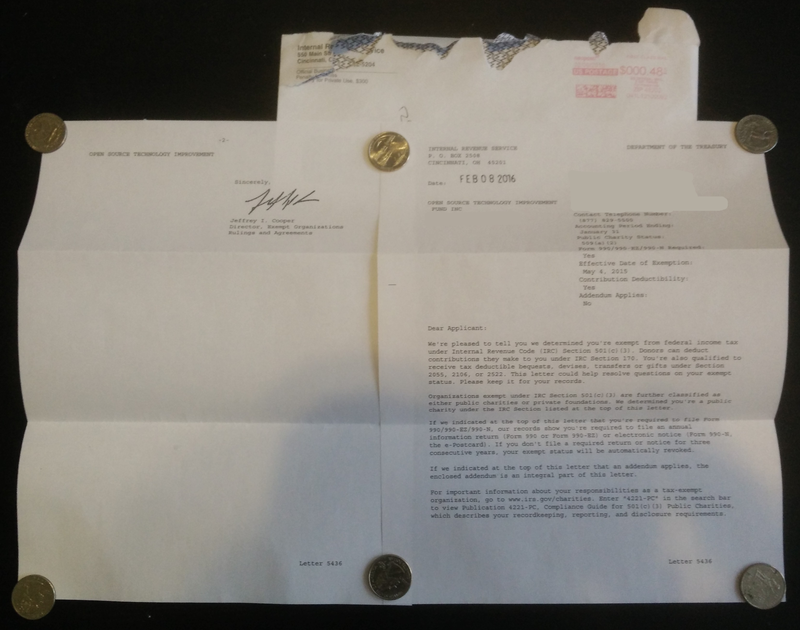 This is the IRS 501c3 certification letter from the US Treasury department. We are now an official charity. Thank you for your ongoing support and as always, support free software!